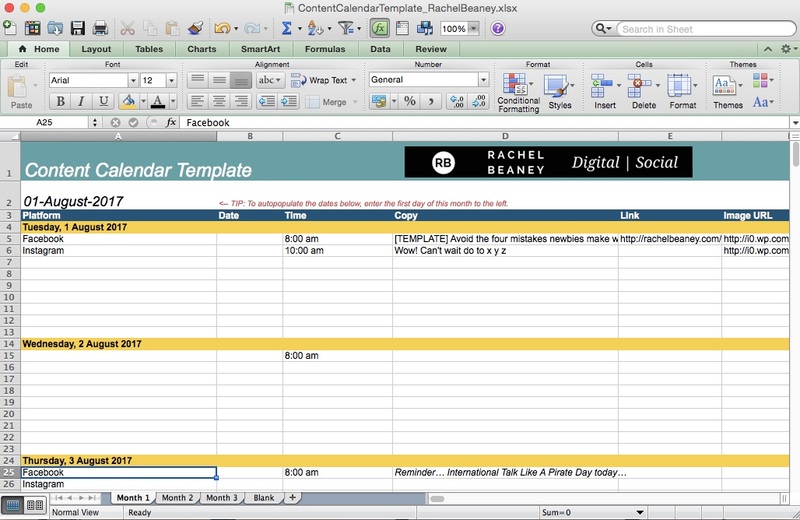 This beautiful Excel template has everything you need to get organised with your social media content calendar, with columns for platform, date, time, copy, images, approvals and notes to help you stay on track. This template has three tabs along the bottom for the next three months, so you can hit the ground running with your quarterly planning. The whiz-bang feature of this template is that is that by typing the month at the top of the spreadsheet, every day pre-fills with the day of the week and date for the entire month. Save hours of manually preparing your content calendars, and let this baby automagically prepare each month for you in seconds. As a bonus, there’s a blank month included, so you can quickly and easily prepare content calendars for the rest of time. Instead of it taking hours to prepare your content calendars, it is down to a few clicks. Worth it? Totally! New! This is now also accessible as a Google Sheets document for those who work directly from Google Drive. See a full-size preview of the Excel document here. Some versions of Excel which were released in 2003 or prior may experience some compatibility issues. Should there be any incompatibility issues after your purchase, please get in touch.